When Shereef Bishay came to me for copywriting help, the Learners Guild website looked and sounded like a typical non-profit brochure. But Learners Guild isn’t seeking grants. It’s seeking profits. As a public benefit corp, Learners Guild offers top-notch software development training to everyone with a passion for coding, especially people of color and people from other groups underrepresented in the tech world — without incurring mountains debt. 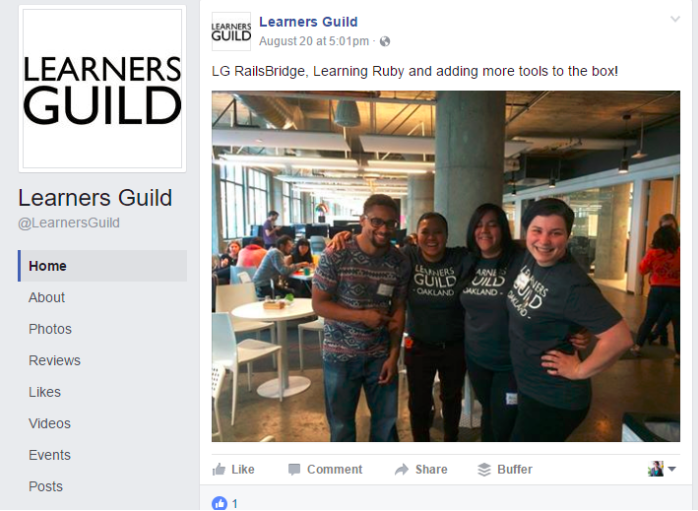 Learners Guild makes money through an income sharing agreement with its participants after they graduate from the ten-month program into high-paying positions as software engineers. For three years after completing the program, participants give a portion of their salary to the Learners Guild. They only pay Learners Guild back if they’re employed in a high-paying software job. The more money their graduates make, the more money the Learners Guild makes. When Shereef told me about the Learners Guild business model, I could barely contain my excitement. My own student loans weigh me down like a cement block and prevent me from saving money, owning a home or even paying for childcare. The thought of tying the financial success of an educational program to the financial success of its students made perfect sense and I was eager to get this project off the ground. 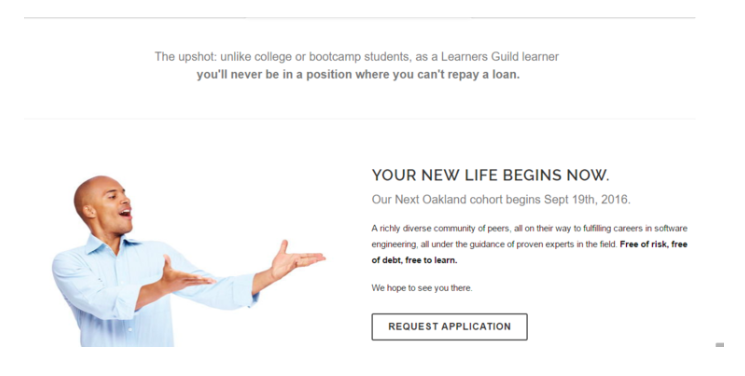 The problem was, Learners Guild was having a tough time finding qualified recruits for their first Oakland cohort. It wasn’t that there weren’t any students of color with a love of coding in Oakland, CA. I mean, hello: we’re talking about one of the most diverse cities in America, within an hour drive of Google, Facebook, Hewlett Packard and other tech giants. Learners Guild sounded like yet another out of touch white savior. If there’s one thing I learned as I immersed myself in the world of their target participant, the last thing anyone from an “underserved community” wants is to be seen as a charity case by the people who are seeking to help them. And when people from communities that have been snubbed or ignored by the tech world see the word “diversity,” it’s met with understandable cynicism. With people of color in less than 1 percent of c-level positions at Fortune 500 companies, “diversity” has become an empty marketing phrase geared to make members of privileged groups feel better about themselves. It was up to me to seek the answers by doing the work of listening, internalizing, and understanding. And if I didn’t understand something, it was up to me to educate myself. One of the top issues I learned once I started listening was that while many tech companies claim the lack of worker diversity is due to a limited talent pool, many people of color at all socioeconomic levels— especially women of color — lack the direct route from school into a well-paid career that many middle-class white Americans enjoy. It’s more likely for a white guy to have a crucial family connection or influential friendship with a Silicon Valley hiring manager than a woman of color from the same neighborhood. And even if they went to school together and achieved similar grades, the power dynamics of gender and race in a tech learning environment can have a negative impact on a woman of color while building the confidence of a white man. I knew if I was to win the trust of potential Learners Guild recruits, I had to reassure landing page visitors that our program wasn’t going to make their biggest problems even bigger. The headline & subheader are designed to make clicking the call to action button as frictionless as possible. And while the copy doesn’t specifically indicate that Learners Guild actively recruits people of color, women, and LGBTQ people, the gorgeous stock photography sourced from WoCinTechChat (and later from their first cohort) sends the message loud, proud, and clear. The sliders just below the founder’s message addressed some of the biggest hurdles PoC in tech have to overcome: a lack of important career connections, a lack of mentors who get how privilege can impact one’s career trajectory, and a general disconnect from the larger tech community. I wanted participants to know they will be contributing members of a learning community of peers and experts — instead of passive outsiders who have nothing to teach and everything to learn from a closed network of tech insiders. People were so amazed by Learners Guild’s unique selling proposition (debt-free education), they thought it was too good to be true. The final call to action uses a copywriting technique called “future pacing.” It makes the reader imagine herself in the situation being described. And the scenario I’ve described is EXACTLY what Learners Guild's target participant is striving for.